A couple of friends of mine joined a local Motorcycle Touring Club (Moto Touring Club de Plerin) in Brittany. They wanted to improve their command of the French language as well as expanding their knowledge of this part of France, so they selected this Club which had only French members, they found friendship and a general welcoming attitude. The Club specialises in group ride-outs, generally lasting for a day, discovering rural Brittany with its virtually empty roads (compared with the UK!) and also has many other social events during the year. For example this year, 14 members of the club visited Belgium at Easter (yes it did snow!!) where they were hosted by the Du Panne Moto Club who showed them their region and lavished hospitality (and Belgian beer) on their group. The favour was returned in May when 8 members of Du Panne came to Brittany, along with 10 riders from N. Ireland and a further 8 riders from Germany to celebrate the MTC 30th anniversary, a weekend of festivities. A great time was had by all and MTC will be visiting both Belgium and N Ireland next year. 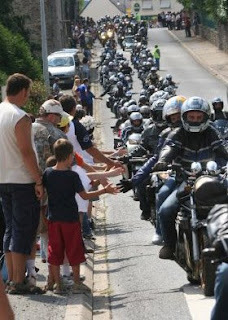 An annual international gathering of Bikers takes place at Porcano in Department 56 (Morbihan) on August 15th ( Assomption - public holiday) each year. The event is called ' The Madone des Motards' and MTC attended with 18 riders. This event started in about 1975 when the local vicar, who was a biker, blessed about 5 members of his congegation and their bikes. The event has been repeated annually thereafter and this year over 20,000 riders were present (see photos)- all who wished to have their bikes blessed did so (there is no compunction for this and all are welcome whatever their religion), those who just came 'for the ride' enjoyed an 85km ride out through surrounding villages when the local populace turn out with flags etc to welcome the riders, the procession through each village takes about 2 hours to pass! When not roaring around the French countryside on his BMW, Nick runs a Surveying firm who carry out pre-purchase building surveys for 'Brits' who buy houses here in France http://www.french-property-survey.com/ why not contact him if you think he can advise you on your house purchase?